It’s time to get creative! When you inherit the Cavendish heirloom china company, it’s in desperate need of some work. The once grand dinnerware company is now in need of new patterns to restore its reputation for elegance and quality. From classic to contemporary, you’ll scour the globe for the best patterns and ingredients, and then refine each piece of dinnerware for the production line in Rare Treasures: Dinnerware Trading Company, a fun Strategy game! While manufacturing dinnerware is agreeably an odd concept, this game will satisfy the die-hard fans of the Chocolatier series. Chocolatier is unique in its own right, and even though Winemaker Extraordinaire is the same genre, W.E. still wanes in comparison to the delights of playing Chocolatier. Rare Treasures, I think, is better in some ways than W.E. I'm sure all of us who are crazy about Chocolatier will agree that we have not been able to find a substitute for Chocolatier, because there are none! So we continue to play the Chocolatier series over and over because of it. I think this game will help break the monotony. If you like Chocolatier, you will most likely enjoy this game. If you're a Chocolatier-psycho, like me, you will want to own this game! :-) It's a good game; just a weird idea for the product being manufactured. Similar to the Chocolatier and Winemaker games, this one builds on how to make china. The best thing about this is that it is not timed; you can go at your own speed. Figuring out how to design and produce the china is one of the most engaging things about the game. You still have to go through setting up the production as you did in the other games. Supplies and missions are found globally when you are tasked to go around the world in order to fill your orders. Making money and china are relatively easy to do. I like this game and find it relaxing and yet somewhat strategy driven. Taking the time to read about the various china designs and why they're produced in certain countries is also intriguing and educational. I highly recommend this game if you liked Chocolatier or Winemaker games! I found the subject of the game interesting, but the mechanics had problems at times that made the game frustrating. For instance, sometimes I would click the button to make a batch of dinnerware at one factory and it would make a batch at another factory instead. If I was short on supplies AND time, I had to travel to the nearest supplier and re-buy what I need in order to fill the order. I enjoyed the Chocolatier series, and I enjoyed this game, but it isn't the quality of game that Chocolatier is. I have played Chocolatier and loved that series, so I was happy to find one that is similar! The game was fun and the different patterns you could collect was interesting! I found it quite addictive and easy to play. I enjoy this type of game with being given tasks to do to go and perform the tasks and then deliver the goods. This is no way near as good as Chocolatier but it is very enjoyable anyway. The mini games of the shaping and the glazing get very very tedious though after you have done it something like 100 times. They were not very challenging so it was just a boring necessity to do them. All in all a good game which I am glad that I bought and it does have some replay ability to it. I don't usually review games but this one I thought I needed to. 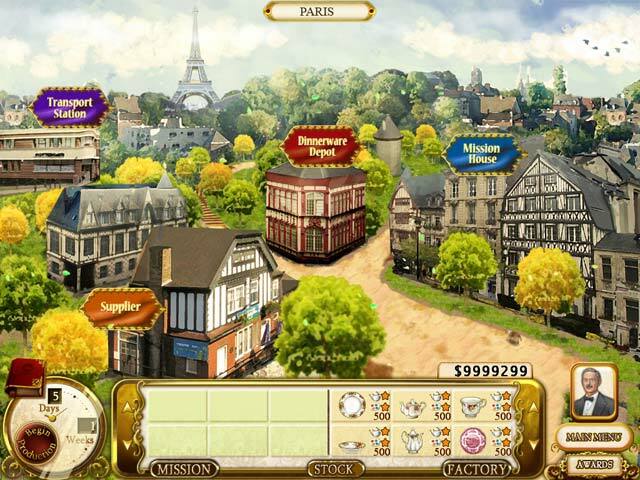 I love love love tycoon style games. This one is very similar to Chocolatier but not as much fun. It would easily be more fun (and more stars# if you didn't have to play the same 3 tedious mini games every time you get a new design. It takes so long to get through it #even though they are not that difficult# that I just can't play the game for more than maybe 15 minutes at a time. I'm pretty bummed about that because I really like the game otherwise. I've stuck it out long enough to have reached about 7 locations. I'll keep plugging along #slowly) but I thought you would want to know. 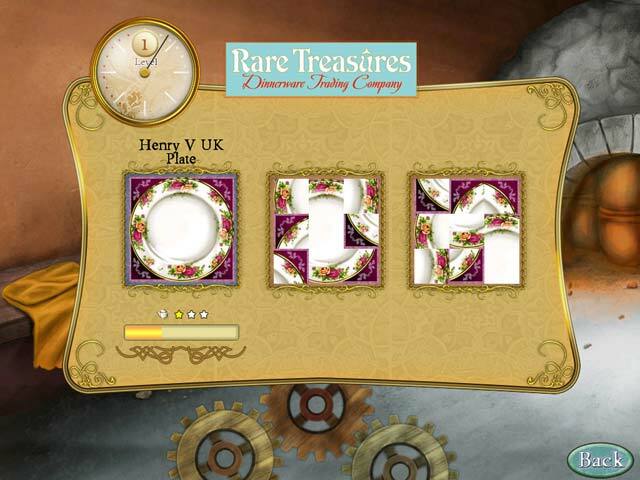 The "Rare Treasures: Dinnerware Trading Company" game has a kind of a mix of genres in it. 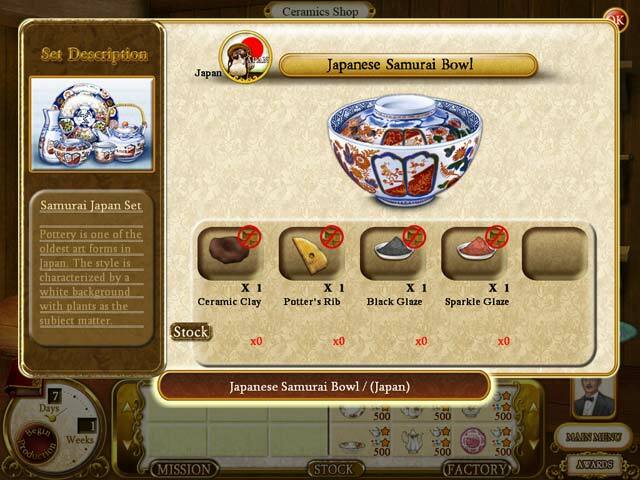 The game is partly a "trade" game and have some "adventure" elements but unless one just wants to "aimlessly" "travel around" and buy , produce and sell then the the game play is mostly focused on the players ability to recognize, memorize and fast mouse click rearrange graphics (as in picture parts, colors and "picture" representation of objects). This consists of somewhat repetitious "mini games" within the game where the player have to recognize, memorize and fast mouse click rearrange graphics. While this is kind of repetitious then the difficulty gets higher as the game progresses and with respect to this then it is actually a lot like many "time manager" games.... If someone is "turned off" by the idea that the game is about "Dinnerware" then ofcourse this is not a game to buy but if understood that the "Dinnerware" is just the "wrapping" for the general gameplay then it is as entertaining as any other game of its kind.... I think that the game can be entertaining and thus worth buying but the game IS repetitious and some of the "mini games" will probably be very challenging to "master" as the game progresses... I am at my fouth set of "Dinnerware" (Russian) and I already find it challenging to "master" "production line setup" and while difficulty is raised then the game has still become somewhat repetitious - so I guess that the "Rare Treasures: Dinnerware Trading Company" game is a game that one should take a turn at once in a while rather than expecting to play in long streches unless one like the repetition and the level of challenges). This Is A Fun Filled Time Management Game! I bought this game two days ago, & haven't stopped playing it! If you liked Chocolatier and/or Chocolatier Decadence By Design games, Rare Treasures - Dinnerware Trading Company is a must have game for you collection! This game has it all...World travel, Hunt down new china Blueprints to expand your business. The more you progress, the more challenging the game gets (& the china Blueprints, harder to find!) I would definitely recommend this game! This game is worth it just to look at the finished ware. It is always good to look at beautiful objects, and while the gameplay can be VERY repetitive the visuals are nice enough that you forgive it a lot. There is even a bit of a storyline that you got to unravel. There are three basic minigames, a rerrange tile puzzle, a memory game (made easy by the numbers) and a fast click game rearranging elements before they disappear. This last one, even if you do poorly you manage. You may have to do two or three more firings, that's all. And then, of coruse you need to have the elements, but you cannot know what you need until you start production.and then you have to hunt the supplies all over the globe (hint: shop in the countty were the style comes from). A good way to spend a lazy afternoon.